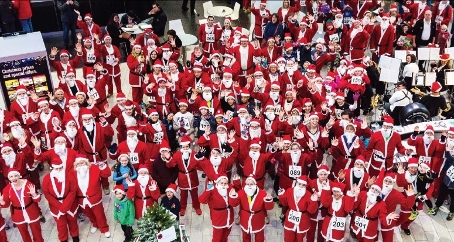 CHRISTMAS came early on Sunday as hundreds of residents donned their red and white suits for Woking & Sam Beare Hospices’ annual Santa Fun Run. 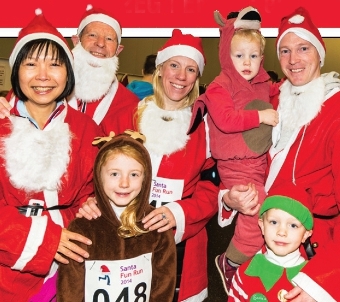 Brooklands was positively brimming with white beards and bobble hats as 351 fun runners jogged and jingled their way around the course at the Mercedes-Benz World complex; with some even reporting a sighting of Santa’s sleigh amidst the German manufacturer’s rather more modern motors. In among the hoards of festive frolickers were Head of Community Fundraising at the hospices, Rosie Gibbon, and Volunteer Co-ordinator, Mary Morgan. 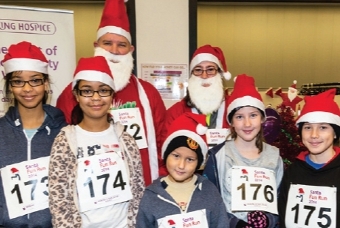 Rory Robinson, Alison Lamb and their staff from Robinson & Lamb Opticians were also a sight for sore eyes as they ran around the 5km-course in their St Nick suits; with the opticians boosting the hospice coffers further still by placing a collection box in their Egham store. 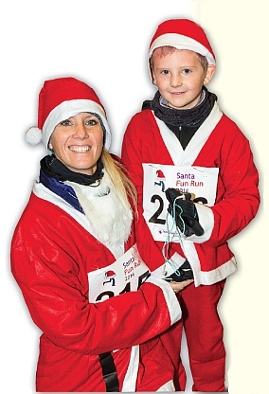 The Stather family have taken part in the annual event every year since it began, back in 2010. Grandparents John and Sonia, mum Becky and dad Michael, and the childrenOlivia, eight, Ruffy, five, and three-year-old Sydney, were there to join in the fun once more in their wonderful onesies. Children, including Marcos Rees (with mum Laura) were also given the chance to meet the real Santa himself – who was hard to find among all his helpers – while other fun activities included a tombola with prizes for the adults. 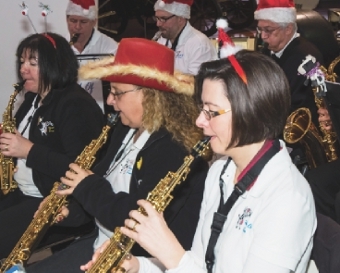 Christmas songs from saxophone troupe Herd of Sax got cold feet tapping, while staff from Nuffield Health led group stretches and even had the crowd twerking in their tinsel to try and raise temperatures on a chilly Sunday morning. Before setting the Santas on their way, the hospices’ Chief Executive, Nigel Harding, thanked all those attending for their support, and paid glowing tributes to the tireless work of the charities’ team of nurses who will be on call throughout the festive period. The hugely popular annual event is believed to have raised in excess of £20,000 for the charities, who aim to raise the £8 million required to operate their services each year through a varied fundraising calendar. The two hospices will be moving to a new site in Goldsworth Park in 2016.